Indonesian police have arrested scores of West Papua National Committee (Komite Nasional Papua Barat) members around Papua on May 30, as Papuan civil society is gearing up for a day a mass mobilizations to sustain pressure brought on by the massive May 3 rallies, where Indonesian security forces beat hundreds of people and arrested close to 2300 people. KNPB members across Papua were handing out pamphlets calling on West Papuan society to rally on May 31 for international mediation to allow West Papuans to exercise their universal human rights of Self-Determination, long denied by Indonesia. The May 31 rally will also be demonstrating Papuan support for the United Liberation Movement for West Papua (ULMWP) bid for full membership of the Melanesian Spearhead Group, which was due to meet in Port Moresby this week, but the meeting has been postponed. the Chief Diplomatic Commissioner from KNPB’s Central Committee, Mr. Cobabe Waninbo, they were taken and held at Jayapura Police headquarters. At time of writing, no response had occurred to WPM attempts to contact Jayapura police regarding charges or time of release. According to KNPB sources, Police have alleged that the leaflets contain subversive material, and all gatherings of KNPB members are illegal as the organisation is forbidden from registration as a legal by a Jakarta mandate, despite the rights allegedly afforded to Papuan people under the long since abandoned “Special Autonomy” provisions, and guaranteed to all other Indonesian citizens. Riot Police belonging to the Dalmas public order unit at 1420 swooped on the Yapis bus stop outside Abepura, and arrested all 34 KNPB Members handing out the allegedly subversive leaflets, confiscating them as well as personal possessions. In Wamena, several KNPB activist were chased, arrested and beaten by Indonesian police for handing out the flyers outside the KNPB Baliem office, activists had just begun leafletting for the May 31 mobilisation when Brimob police swooped and captured 21 of the KNPB activists. Earlier, Three KNPB activists – Darpinus Bayage, Ison Bahabol and Amiter Bahabol – were arrested for leafletting the same flyers at 1025am in Dekai town, Yahukimo, outside the local Bupati (Regent’s) office. According to witnesses of the arrest, interviewed by a WPM stringer, the three KNPB activists were beaten as they were taken to the paddy wagon, and the witnesses reported that they believed the detainees were being “even more severely beaten once the got taken away in the vehicle. At time of writing, the three were still being detained at the Yakuhimo police station. KnpbNews is reporting that despite early arrests this morning, no more arrests have followed the detention by police of the mass gathering in outside the students hostel in Waena, Jayapura. However, students from Paniai and Yahukimo regencies living at the dormitories have launched a surprise distributed but coordinated cultural action, and taken over the demonstration with a vibrant display of Papuan cultural identity whilst speeches were being conducted. THis mass has now reached the gates of the Cenderawasih university where students were earlier arrested, and are now facing a blockade of police, while the speeches continue at Abepura in a distributed action. Arrests by Indonesian security forces of West Papuan demonstrators have just begun minutes ago in Jayapura, as West Papuan people begin planned mass mobilisations to demand self-determination and referendum on the occupied colony’s future. Less than twenty minutes ago, at 0831AM local time, police officers led by the Jayapura region Chief of Police AKBP YERMIAS RUNTINI, have arrested approximately 10 students Cenderawasih University (UNCEN) students, at the gate of the UNCEN Waena student housing dormitory (Perumnas 3). Police are currently barricading the road with barbed wire to the hostel UNCEN Waena hostel where the KNPB headquarters are located. Currently the police are also pursuing activists and patrolling around the Waena taxi roundabout. Indonesian Police have also just surrounded and arrested (0845) the gathered masses who were preparing to rally, filling 3 trucks with students, 1 truck of KNPB members, and two trucks of civilians. This comes after Reports from students in Papua have come in overnight of an attempted raid overnight at a that failed due to student security preparations. A platoon of heavily armed Dalmas Public Order riot police, allegedly containing members of the elite Australian-funded Densus 88 anti-terrorism unit, attacked the Cenderawasih University (UnCen) student dormitory in Waena, Abepura, at 0220 (AM) local time, according to confirmed reports from West Papua National Committee (Komite Nasional Papua Barat or KNPB) officials. However, students maintaining watch ahead of expected security sweeps overnight escaped into the night, thanks to an effective early warning system, according to sources, and the Dalmas platoon gave up the chase. 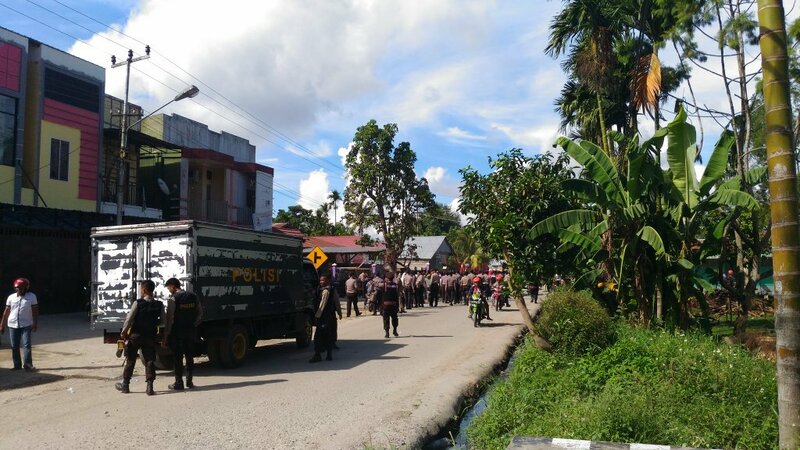 Raids have been occurring across Papua overnight by Indonesian security forces in a bid to terrorise Papuans into abandoning mass mobilisations across the country today, due to start at the time of publication. Reports have come in from Wamena, Merauke and Manokwari of preemptive security sweeps overnight. More information as it comes to hand. The demonstrations are demanding for a referendum as an act of self-determination on Papuan aspirations, seen as treason by the Indonesian colonial government. Indonesian police in Papua have vowed to crackdown on all displays of “separatism” and have banned all gatherings. The rallies form part of a global day of action under the social media hashtag #LetWestPapuaVote, and coincide with a historic gathering of the International Parliamentarians for West Papua network in the UK Parliament on May 3. This is a developing story. More information as it comes to hand. Please follow the twitter hashtag #LiveUpdatesPapua for up to the minute coverage. POLRES MERAUKE POLICE ARREST 15 KNPB ACTIVISTS and CHAIRMAN of the PRD MERAUKE. Information from KNPB has just been confirmed from independent credible sources. On Friday May 1, 2015, at 01.06 WPB (Papua time) heavily armed police officers of Merauke Polres forced entry into the West Papua National Committee (KNPB) Secretariat office in Merauke, and arrested 15 KNPB activists, together with their Mother, PRD (Parleman Rakyat Daerah or Regional People’s Parliament) Chairperson Panggresia Yeem, who were still preparing for a rally today to commemorate the forced takeover of West Papua by Indonesia. An independent source confirmed to West Papua Media that police were heavy-handed during the arrest, allegedly causing damage and rough treatment, however it is unknown at this stage whether any injuries have been sustained. An urgent call from West Papua Media to the Polres HQ went unanswered. and 11 other KNPB members whose names are not yet available. Heavily armed Police have just taken all 16 people, including the matriarch head of Merauke PRD for interrogation at the Police HQ in Merauke. The raids come after the KNPB refused to accept the local police chiefs threats (see Jubi article below) against holding democratic gatherings to mark the May 1st Day of Mourning. Jayapura, Jubi – The chairman of the Merauke People’s Representatives (PRD) in Pancrasia Yem said they were not afraid and intimidated by threats from security forces in Papua, especially the Merauke Police chief. Merauke Police Chief Adjunct Senior Commissionaire Sri Satyatama said police will not allow the West Papua National Committee (KNPB) to conduct activities including the prayer on 1 May 2015 and warned they would be disbanded if they ignored the ultimatum. “The Police Chief’s statement is not big deal. He’s part of invaders. The invaders will keep doing anything to suppress any action taken by Papuans. KNPB and PRD Merauke Region will keep fighting. We will do something on 1 May to express the injustice that had occurred in 1963,” he told Jubi on Tuesday (28/4/2015) from Merauke, Papua.